Using the O-Lynx radio controls allows spectators at the event or on the internet to know when a competitors has gone through a checkpoint, as well as detailed overall, splits timing information. The radio system can be as big or small as your budget allows. 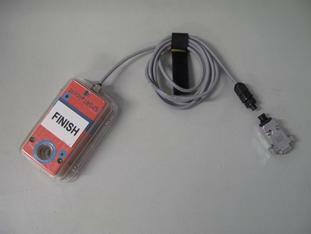 To get started, use a O-Lynx starter kit to add a radio on the start and finish controls. This will allow spectators to know how long competitors have been out as well as immediately know their time when they finish. Because the O-Lynx radios make the controls wireless no long cables are required and setup is easy . For larger events or just to increase the atmosphere at club events, intermediate O-Lynx radios can be setup as well. This will enable times can be compared to other competitors even while the competitors are still out on the course. Another possible option is for controls on the beginner’s or school courses to have radio controls so that its a lot easier to monitor their safety and progress through the course. O-Lynx control modules are very easy to use as they use a mesh operating system that allows other O-Lynx controls to also act as repeaters. This allows the distance covered to be extended to suit the event requirements. No configuration of the radios is necessary as O-Lynx will automatically select the best route for the signal to get back to the event centre – simply take the radios out and use. The O-Lynx radio modules are small ( 105mm x 75mm excluding the antenna ) and light ( 236 grams ) and so are suitable to mount directly onto the orienteering control stands. The modules are designed to be totally weather-proof to withstand the conditions often found at events. A clear lid allows the ultra-bright LED status indicators to be clearly seen even in the daytime. This lid is fitted with a rubber seal, but there should be no need to ever open the enclosures, as the modules are charged by simply plugging them into a suitable charger. Battery Level and Radio Link Quality can be remotely monitored from the O-Lynx Event software. This is particularly useful when the control modules are put out well before the event and are located far from the event centre. Master – this module is located at the event centre and plugs into a PC to collect all punch information. The mode switch is used to switch on a heartbeat signal that transmits to all other modules. This activates the “RX” status LEDs on the units and is useful to check the units are within range when setting up the controls. 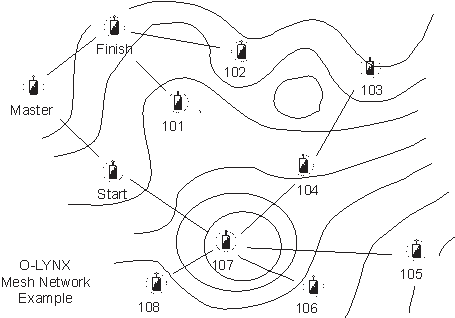 Control – these are the modules put out on the course. They are set up to transmit information back to the Master. for more information of the models of radios available. SPORTident BSM7-D Serial Master stations : The radio modules can connect direct to these stations via their cable. In order to weather-proof the system better and provide a secure connection, O-Lynx modules use a locking waterproof 6 pin connector ( LTW Part No. LTWAU-04BFFA-LL7001 ) instead of the 9 pin D connector the BSM7’s come fitted with. An adapter that converts back to a 9 Pin D plug allows the stations to still be connected to a PC when required ( for programming or checking the punch log – though this can also still be done using a coupling stick ). 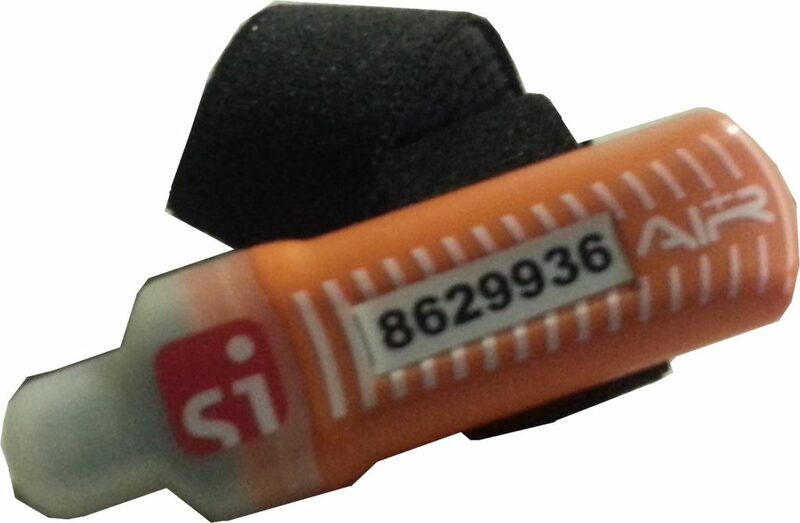 The waterproof connectors are easy to fit to existing SPORTident station cables, although some soldering is required. BSM7 shown with waterproof plug and adapter. Sportident BSF8 Short Range Radio Stations or Sportident SIAC chips : When fitted with a Sportident SRR dongle the O-Lynx radios will receive the punch information wirelessly. 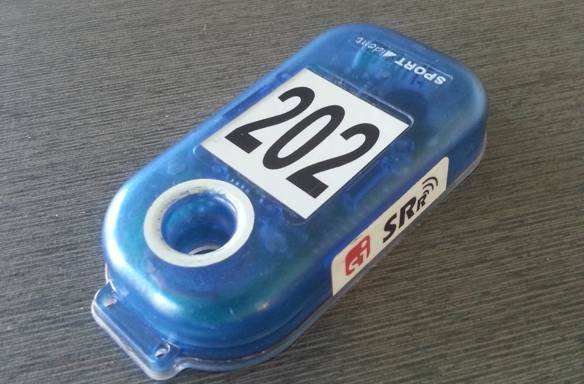 Sportident have recommended 2 dongles be fitted to the radios to cover both the Red and Blue channnels that the Sportident SRR system can use to ensure all punches are captured. The output from the Master O-Lynx module is via RS-232, just the same as if it was a SPORTident station connected directly to the PC. 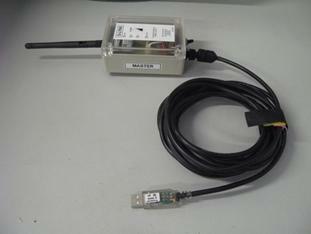 A special 5m Serial to USB cable, as shown connected below, is used to make connecting and transferring the punch information to a PC simple. With such a setup the master will appear as a standard computer COM port, in just the same way as USB sportident master stations appear. The USB cable also charges the master radio while it is connected. The O-Lynx control modules currently use the 2.4Ghz license free band with a power output of 18dbm and are compatible with most jurisdictions around the world. Different antenna sizes are available to fit in with local regulations while maximising transmission distance. The supplied 10dbi antennas keeps the units output power within the requirements of most countries including Austrailia, New Zealand and North America. The radios used in the O-Lynx modules have FCC Class B, IC and CE approval. 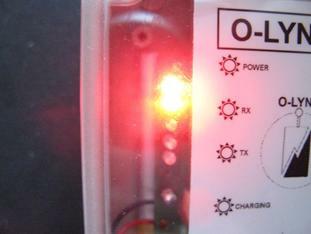 The O-Lynx control modules are powered by an internal Li Polymer battery. These give the units a minimum running time of 16 hours between charges. These batteries have a minimum life expectancy of 300 charging cycles. 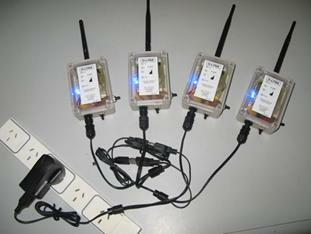 The modules are charged by plugging the charging lead into high power USB charging outlets. When a charger is connected, a Blue LED indicates that charging is taking place and will turn off once fully charged. When the units are turned on the current battery level is briefly displayed on a set of 6 coloured LEDs. O-Lynx modules are designed to mount directly to the control stand, therefore eliminating having cables lying around when using wired controls. For SRR or SIAC use a separate stand is recommended as it gives you more flexibility in placing the radio for the best reception. The mounting bracket has been designed to attach easily to most control stands using a simple hose clip. Once this bracket is attached, the control modules simply clip onto the bracket in a way that makes them securely fastened but easily removed.